Y-3 Limited Edition w/ James Harden! 4/5/18: Super Fresh, Hot, New Info on Y-3 x James Harden! Y-3 is launching a Limited Edition collection with James harden on Friday April 13, 2018. The Video below is a teaser of the various pieces. Almost all items are in black which is super cool. Some Indigo/Very Dark blue and Champagne/Off White. A Bomber Jacket, Cropped Pants, A Blazer, Hoodie, Tank Top, Regular and Compression Shirts, some logo’d Leggings and 3 different Shoes. The BYW Bball, The Laceless Tamgutsu and my favorite, the Bashyo featuring the bright pink petal flower. Some items come with the Y-3 stacked logo with inclusion of the Pink Petal Flower. For some reason, Y-3 is my fav brand of late. And this collection looks like a must shop. Hoping there’s some affordable gear on launch date. Here is one of the sites that should have the dope dudz on release date See You on the Streetz! 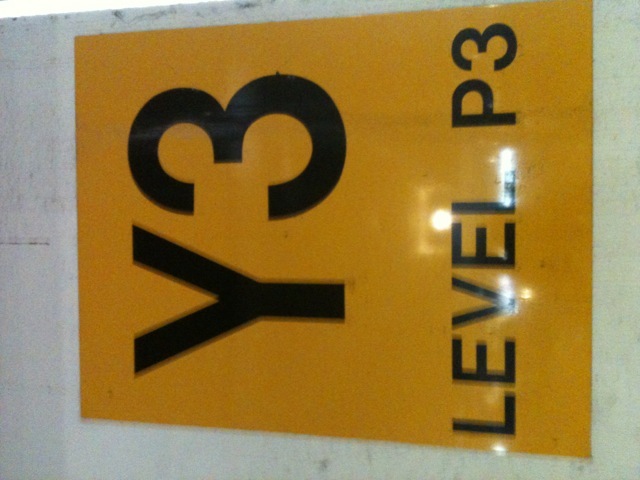 …you see a sign that says Y-3 in the Sam’s club parking lot letting people know what level and area that they jut parked in. And instead of thinking its a parking sign like most people you get real excited from the sign and walk up close to it thinking “Wow! Y-3 -Oh Man! I sure hope there’s a sample sale or pop-up store nearby” and seeing this sign in yellow and black, it sure doesn’t help that the Y-3 brand Uses orange and black as their brands colors. Me being a pretty bad fashionister especially when it comes to kicks and jeans went right up to the sign and took this picture. And “No” there was no sample sale or pop-up store nearby. Bummer. 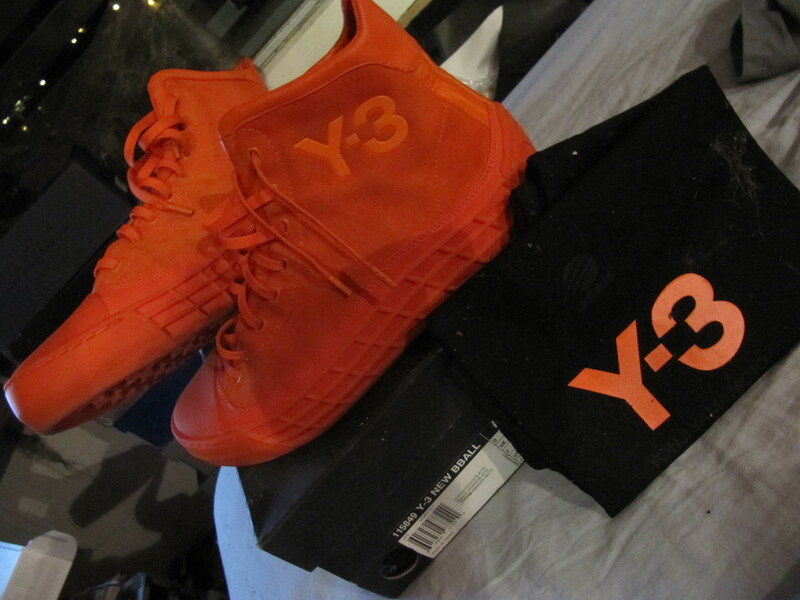 My Y-3 super bright Orange Hi-Top kicks! 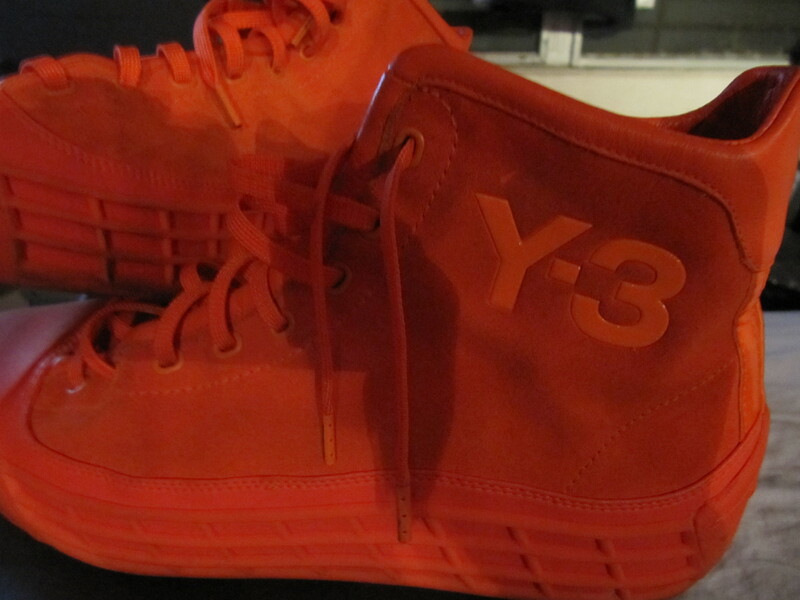 Yep, They’re Bright but they’re REAL Y-3’s and that is what matters most! The funny thing about these shoes is the box says they are for basketball-see below-I cant see anyone in this world wearing them to play basketball. they are soft suede Fashionister shoes only made for late night european style dinners and hotel Costes After hours lounge parties. Play B-Ball in these? Hell No! These are sweet, expensive, big time designer shoes! a very fashionable person, especially one who works in the fashion industry. And I define Fashionister (Fash-Uh-Nee-Stir) as the male version of the female Fashionista. For some reason, I couldn’t find Fashionister on Wikipedia, encyclopedia Britannica or even dictionary.reference.com. Hey-Next week, I’ll be in Seattle for my Step Sisters Weddng. I’ll be hitting the streetz with new QR-Code Stickers and scoping out the latest fashion finds for all the fashionistas and fashionisters, street culture vultures, trendhunters, Hot trends peeps etc. stay tuned for the Seattle Streetz blog.com Leave a comment if you like, LMK your favorite sample sales or tips on what to do at a sale or email me at alohabros@gmail.com or text or call me if you live in Seattle and have some cool places you think I should check out! AlohaLatersForNow.